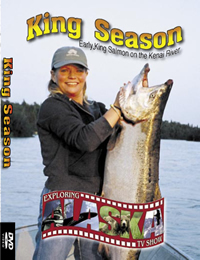 Experience the Early King Season on the world famous Kenai River with this brand new DVD produced by Exploring Alaska here in Soldotna in 2005. You'll see true Alaskan Adenture. Witness rod-bending action while experiencing the world's best fishing in the Land of the Kings! Savor the solitude of fishing in a pristine wilderness, where turquoise waters produce King Salmon as spectacular as the river they come from! The MILEPOST® is the legendary travel guide to the highways, roads, ferries, lodgings, recreation, sightseeing attractions and services along the Alaska Highway to and within Alaska, including Alberta, British Columbia, Northwest Territories and the Yukon. Find Trip Planning Help and Frequently Asked Questions about highway, ferry and fly/drive travel to Alaska and Western Canada. Since 1949, The MILEPOST® has been the most trusted and complete guide for highway and ferry travel to Alaska, the Yukon, British Columbia, Alberta and Western Northwest Territories. Updated annually, The MILEPOST® gives you detailed information on everything from the famous Alaska Highway system to cruising Alaska's Inside Passage. Kenai Riverfront B& B/RV Park has numerous traditional family and Alaskan style recipes featured in this years edition! Be sure to pick up a copy soon for a great taste of Alaska!